Is it time to upgrade your refrigerator? Perhaps you are getting that brand new washer and dryer set you’ve always wanted. Or, maybe you just want to replace that old stove. No matter what type of appliances you’ve got on your hands, those bulky items can be a real challenge to get rid of on your own. 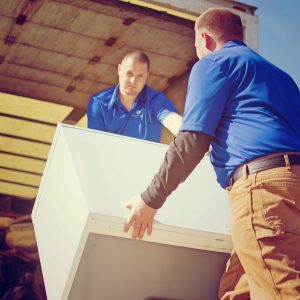 Unfortunately, these items don’t have the value they once had, after being used in your home for many years, so trying to take care of appliance haul away in Springfield Missouri on your own is not easy. Items such as refrigerators, stoves, washers, dryers, and dishwashers, are extremely bulky and hard to maneuver out of your front door. Once they are out your house, what then? You can’t leave these items by the curb, because they will still be there weeks from now. Instead, simply pick up the phone and call Dog Gone Junk. You won’t have to move an inch, other than call us for your free estimate. Our professional, friendly and efficient team will come to your home and remove all of your unwanted appliances. Whether it is a whole kitchen, basement, or a whole home’s worth, we can take it for you. If you are simply trying to get that old big, awkward refrigerator out of there, we can do it. There’s no amount too big or too small for us to handle. We will come and remove your unwanted appliances, sweep up after ourselves, and then be out of your hair in no time. If your items still hold value that a family in need could use, then we will try and donate those items to them. You can rest assured that your items are helping someone in need. If there’s no longer value to your items, you can be sure that we will recycle these items properly. We always dispose of your personal items responsibly and ethically. Call Dog Gone Junk today for your no-obligation, no-hassle, free estimate.